Cybersecurity is dead. …that is, the way it was originally designed and is currently deployed. Our reliance on computing and communications is critical to our way of life, and is increasing every day. It’s not just our computers that are at risk; rather, increasingly attacks jeopardize careers, wallets, companies, infrastructure, and even lives. A fresh approach to security — one that understands that organizations aren’t perfect, that employees sometimes work from home, that clouds and mobile are a necessary efficiency, that supply chains are integrated, and that adversaries are both skilled and motivated to attack — will tip the balance of power back to the good guys. This fresh approach is our future and is based on advanced technology coupled with an approach that assumes that bad guys will get in somehow/somewhere/sometime, but that the damage they do must be localized and limited so that it’s not front page news. 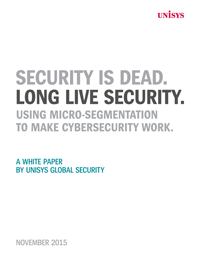 Download this paper as it outlines the power of Micro-segmentation to do just that.